With fall finally appearing in Salt Lake, you’ll want to start preparing for the colder weather. The key to transitioning from summer to fall is layers. There are many ways for you to layer up when it comes to fall clothing. 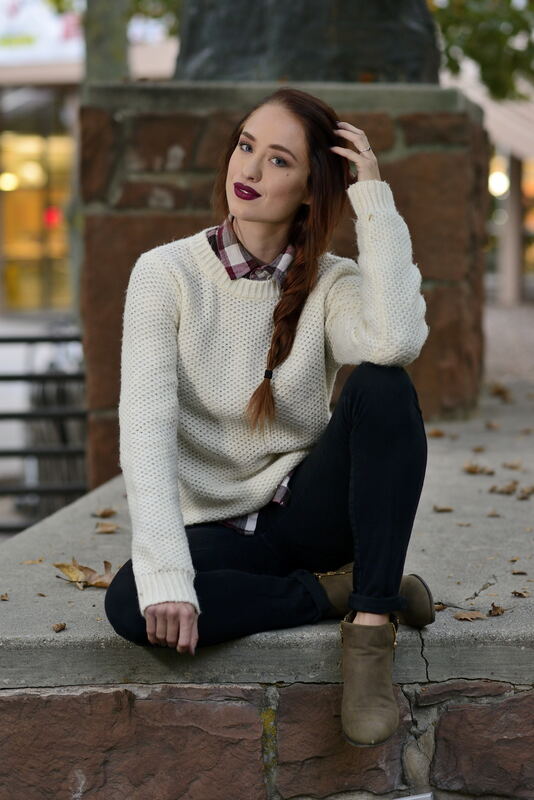 Check out some of these cool looks to show off your best fall fashion. Everyone knows that autumn means sweater weather, but let’s take it one step further. A great styling trick for sweaters is throwing on a collared shirt underneath for an extra layer of warmth, plus a pop of color or pattern. I like pairing creamy white sweaters with a plaid shirt underneath. You want the collar to just peek over the neckline of the sweater. You can even roll up the sleeves and expose the shirt underneath for another pop of color. One of my favorite pieces for fall is a basic flannel. They are perfect for layering and can be worn traditionally or around your waist for a fun ‘90s grunge flare. For this look, I paired a longer flannel shirt in red and black with a pair of distressed jeans. I like to tuck in a piece of the front of the flannel and cuff the sleeves. A nice styling touch is a chunky necklace to add a touch of glam. This particular flannel doesn’t button all the way down, but if you have one that does, put a crisp white tee underneath so you can tie the flannel around your waist if it gets too hot outside. I like to think of fall as leather jacket weather on top of flannel and sweater weather, and an exciting tip is to layer all of these key components together. Start with a comfy but tailored flannel shirt and then throw on a neutral-colored sweater over it. The last step is a leather jacket. You want to make sure you choose one that hits you directly at your hips and is tailored but not too tailored. I like to use a size up in my leather jackets that I’m using for outerwear because it allows you to throw on pieces underneath without constricting you. The great thing about this layering trick is the ability to take off pieces if the weather warms up, which can be expected with Utah’s temperamental climate. Layering is all about taking basics and making them work seamlessly together. You want to keep the individual pieces on the thinner side so you don’t feel overwhelmed with material. Don’t be afraid to try out different colors and experiment with your fall looks. You won’t be disappointed if you get a compliment for thinking outside the box when it comes to your outfit.